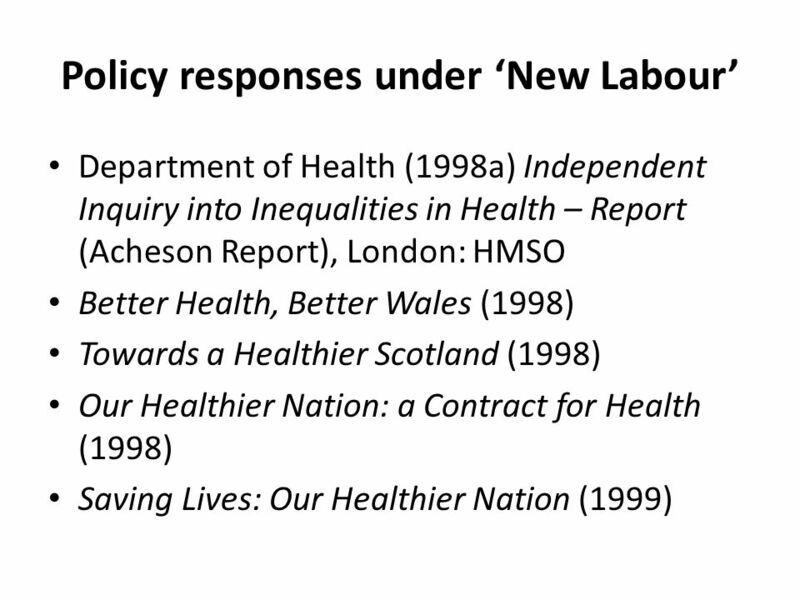 Devolution and public health: the case of health inequalities Gareth Williams School of Social Sciences Cardiff University. 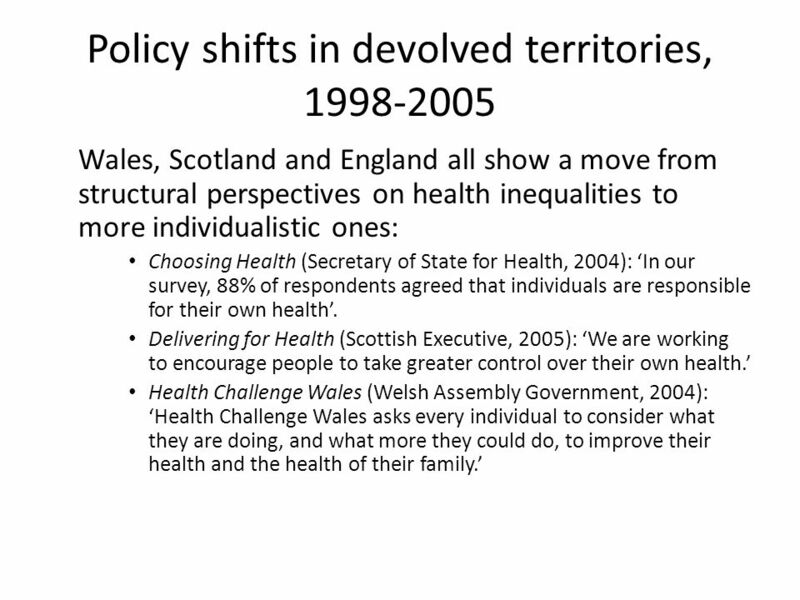 6 Policy shifts in devolved territories, 1998-2005 Wales, Scotland and England all show a move from structural perspectives on health inequalities to more individualistic ones: Choosing Health (Secretary of State for Health, 2004): In our survey, 88% of respondents agreed that individuals are responsible for their own health. Delivering for Health (Scottish Executive, 2005): We are working to encourage people to take greater control over their own health. 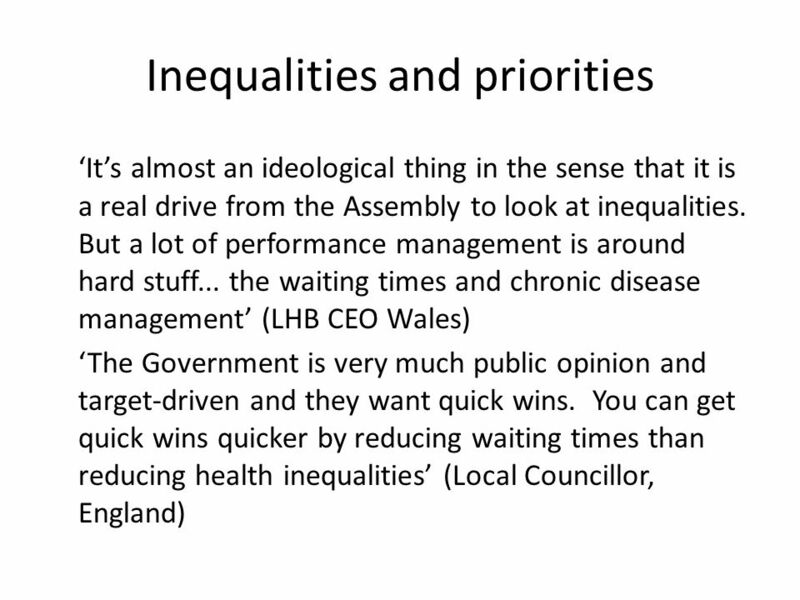 Health Challenge Wales (Welsh Assembly Government, 2004): Health Challenge Wales asks every individual to consider what they are doing, and what more they could do, to improve their health and the health of their family. 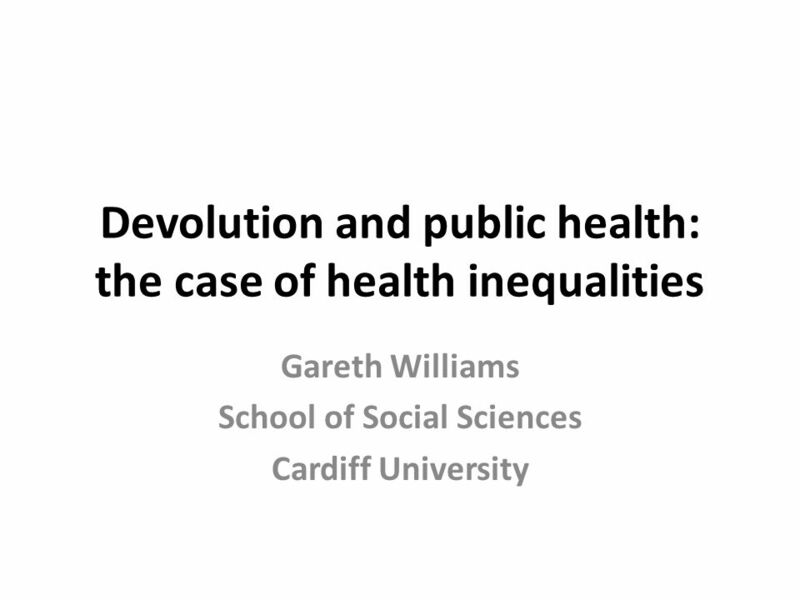 Download ppt "Devolution and public health: the case of health inequalities Gareth Williams School of Social Sciences Cardiff University." 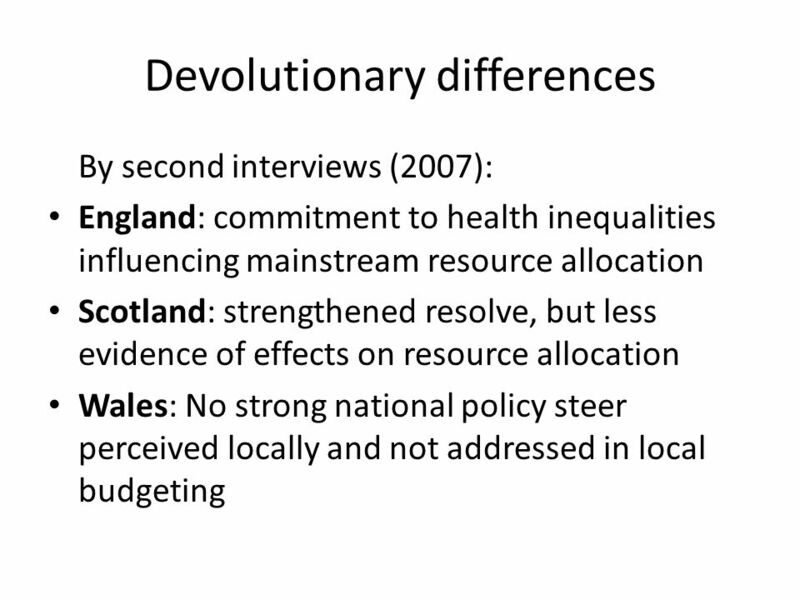 Devolution and divergence in UK health policies Dr Jennifer Dixon Director Nuffield Trust IPPR 2 February 2009. 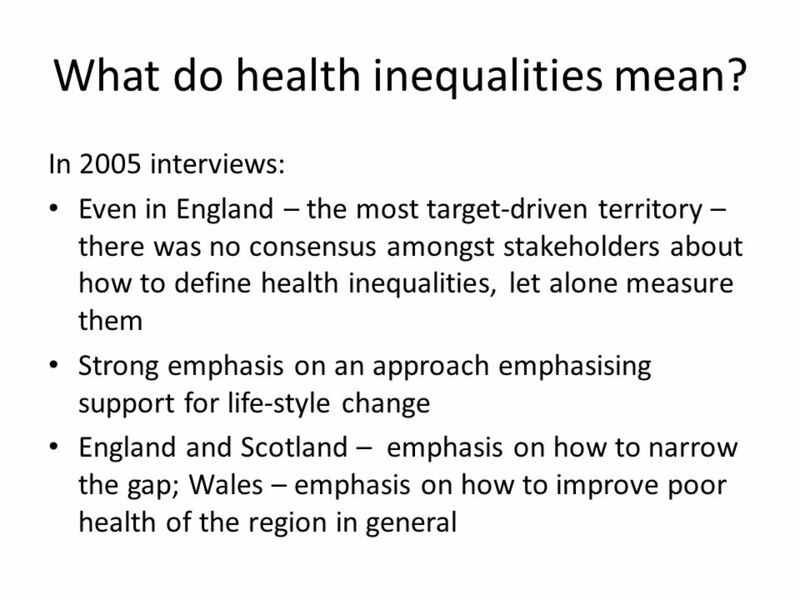 School of Medicine & Health The Wicked Issue of Health Inequalities Professor David Hunter. 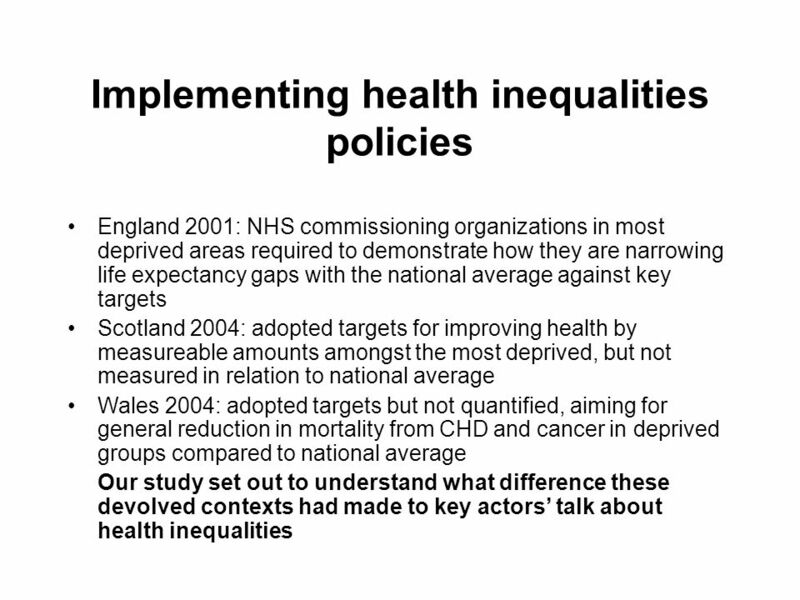 The Health Background Britain has amongst the worst levels of obesity in the world. Smoking claims over 80,000 lives a year. 1.6 million people are dependent. 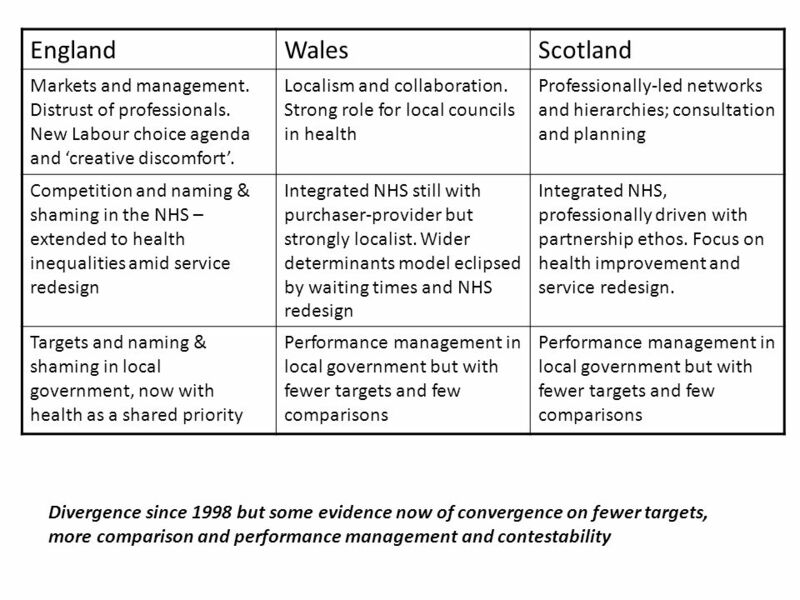 1 Practice-based Commissioning Dr Richard Lewis Independent Healthcare Consultant & Fellow, King’s Fund. 1 Children’s Service budget proposals 2013/14 Formal consultation. Croydon Clinical Commissioning Group An introduction. 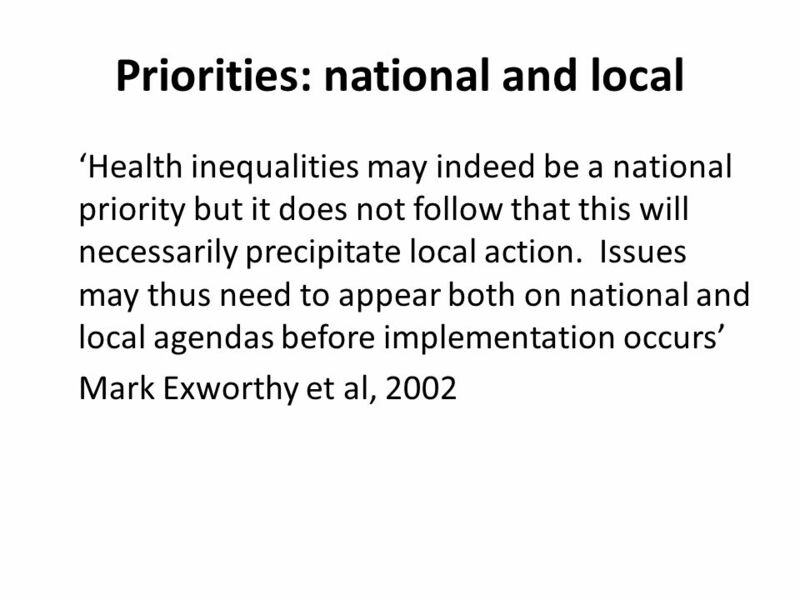 GREATER LONDON AUTHORITY Towards delivery of the London Health Inequalities Strategy London Public Health Network 21 st May 2010 Helen Davies GLA Health. Improving Health through Healthy Schools Cathy Wynne Regional Public Health Specialist NW DHSC North Lancashire Healthy Schools Programme Launch April. 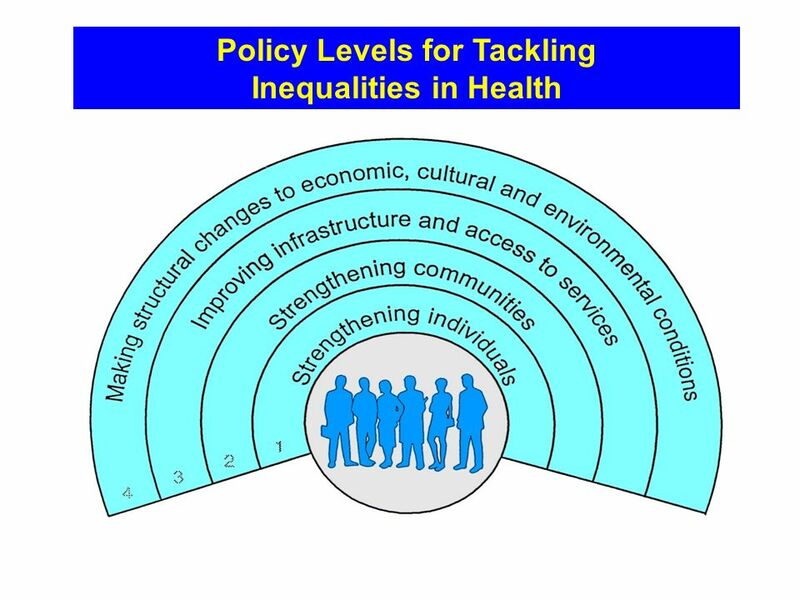 Initiating a Well Being Strategy in Moray Strengthening the public health function and role of Moray Council as a health improvement organisation in tackling. 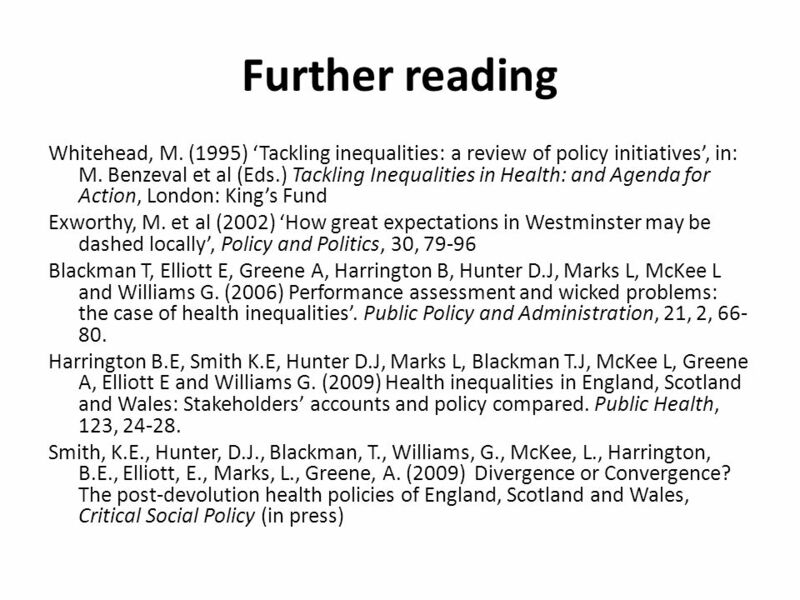 SECTION B: SOCIAL ISSUES IN THE UK Study Theme 2: Wealth and Health in the UK 6. Peter Peacock Ideas, to policy, to action. 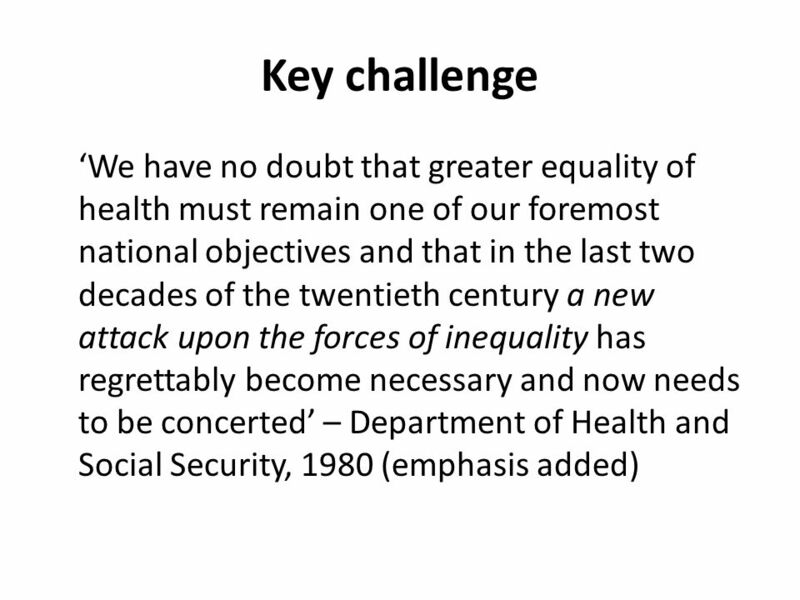 Long term Ageing population Climate change Technology advances Medium term Public spending constraint/decline. VCS Intelligence a public health asset Alison Patey. Welcome Monday 15 December 2008 Sunley Management Centre. 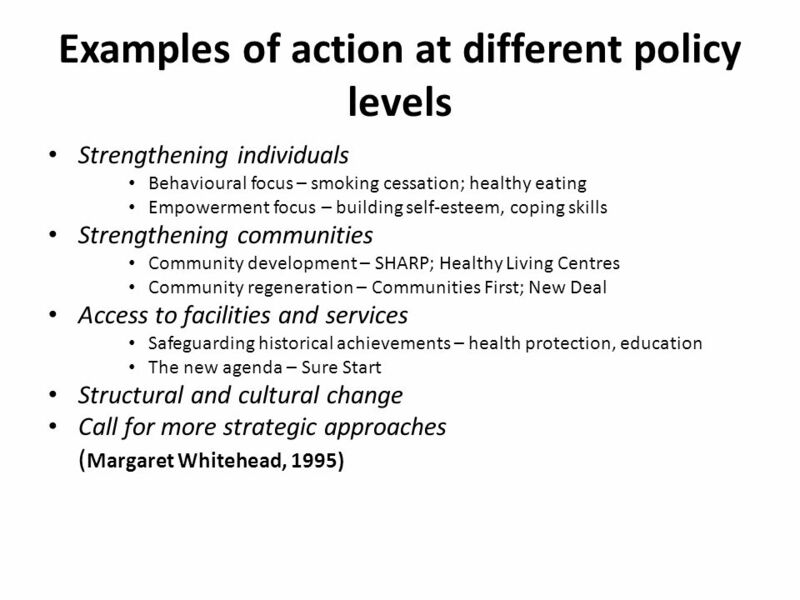 Improvement Service / Scottish Centre for Regeneration Project: Embedding an Outcomes Approach in Community Regeneration & Tackling Poverty Effectively. 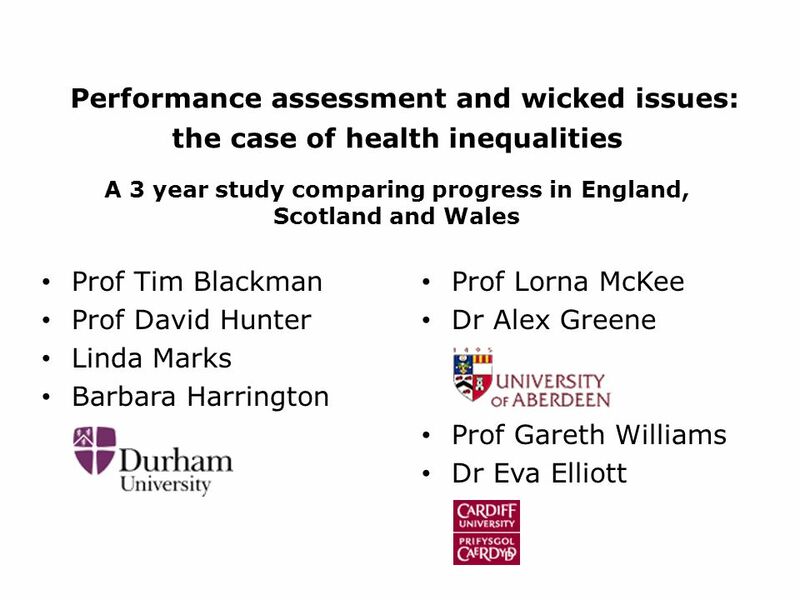 Wicked issues and performance assessment: The case of health inequalities A comparative study of England, Scotland and Wales Prof Tim Blackman. 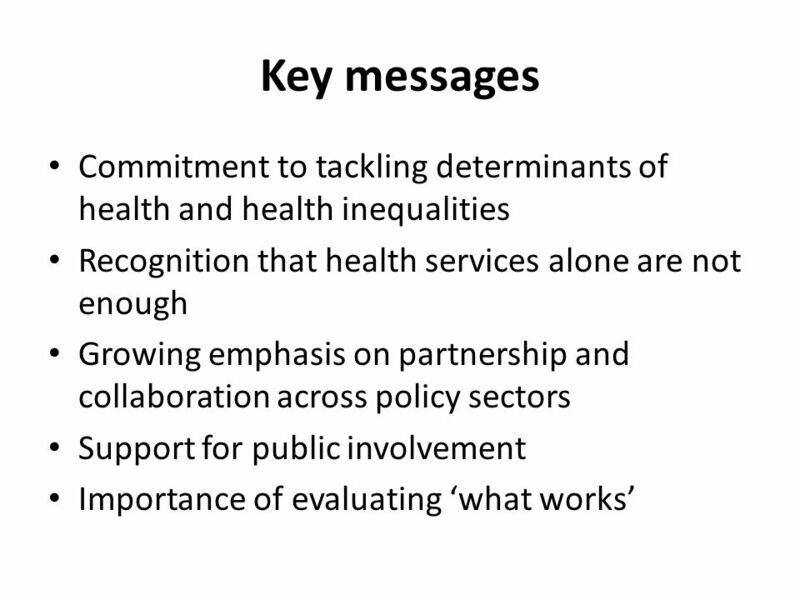 Progress Through Partnership Improving Health Dr Yvonne Arthurs Deputy Regional Director of Public Health in South East Public Health Group. 11 Setting Direction Broad Scanning Intellectual Flexibility Seizing the Future Political Astuteness Drive for Results Self Belief Self Awareness Self.